The paparazzi photos from the otherwise closely guarded set of Christopher Nolan’s Dark Knight Rises have been coming at a rapid pace, and from them, we have been able to learn quite a bit about the final installment of the Dark Knight trilogy. For example: There will be a Batman. And also a guy named Bane, who has an unusual bump on his back. The Batmobile now rolls around in camouflage and sometimes picks up bride hitchhikers. 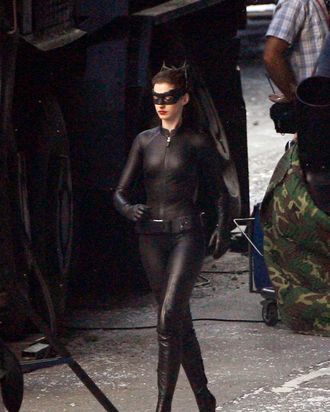 And now comes our most recent discovery, courtesy of long-lensed snoops: Anne Hathaway sports cat ears and fights grifters with what looks like a poisoned apple. Come, see the evidence for yourself!